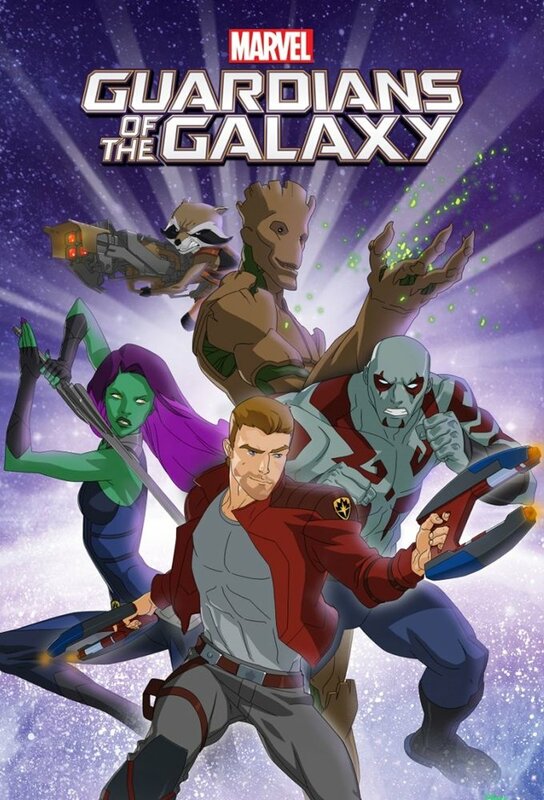 The newly-christened Guardians of the Galaxy come into possession of a dangerous artifact that has Thanos’ new lieutenant, Korath, after them. The Guardians struggle to subdue the suddenly-sprung-to-life Celestial head that is the Knowhere space colony, as well as storm Korath’s ship to rescue Quill, Gamora and the mysterious CryptoCube that holds the Cosmic Seed. Feeling underappreciated, Rocket accepts an offer to work for The Collector, only to realize his job is working as another prisoner in The Collectors collection. The Guardians crash land on a space station run by the Grandmaster, who schemes to get Drax back in the gladiatorial arena to battle his ultimate opponent: Gamora. While getting another item for the Collector, Groot gets infected with an alien fungus, turning him into a giant rampaging monster. Caught red-handed by Titus, the Guardians are coerced into infiltrating a notorious gang of weapons dealers known as the Black Order. Quill gets mixed up in a game of deceit when Gamora tries to pit her siblings, Nebula and Korath, against each other. When Groot is infected by a super-evolved Venom Symbiote, Rocket must go to extreme measures to save his leafy friend. Rocket is abducted and taken back to his home planet, Half World, where he gets caught up in a revolution of evolved former test subject animals. The Guardians encounter a living planet thats fallen under the control of a revived Ronan. The Guardians get caught up in a rivalry between The Collector and The Grandmaster. The Guardians get caught up amongst the Inhuman Royal Family and must help save the City of Attilan from Ronan. The Guardians find the Asgardian Destroyer Armor that leads to an epic battle pitting the Destroyer Armor against Drax the Destroyer. Quill goes missing while following the Cryptocubes readings. The Guardians must stop Ronans plan to blow up the Kree Supreme Intelligence. In search of the Cosmic Seed, the Guardians unexpectedly find themselves in Asgard where they must outwit Thor and Angela in order to discover the seeds origins. Gamora attempts to make amends for her past misdeeds only to find herself in a deadly trap set by Nebula, Ronan and the Grandmaster. The Guardians pay the Inhumans a visit to learn more about the Cosmic Seed. The Guardians discover that the Cosmic Seed is back on Earth. In the company of Cosmo, Star-Lord returns to his hometown where he runs into his childhood bully who is now the sheriff. Now Star-Lord and the Guardians of the Galaxy must find the Cosmic Seed before Korath the Pursuer does. When the Guardians of the Galaxys search for the Cosmic Seed continues on Earth, they are forced to confront Ronan the Accuser, Nebula, and Thanos. The Guardians battle a Cosmic Seed supercharged Thanos, who takes control of the Earth and molds it into his personal planetary weapon of mass destruction. The team stages a Christmas Carol-inspired con job in order to frighten a despot out of his ill-gotten riches and free his enslaved people.